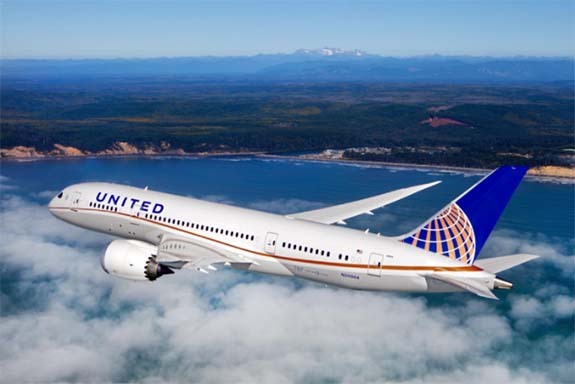 A United Airlines pilot traveled 2,500 miles to hand-deliver a bridal set to a traveler who had lost her precious cargo while hurrying aboard a flight in New Jersey. Not only did the pilot "go the extra mile" to deliver the jewelry, but he also included a heartwarming personalized note. 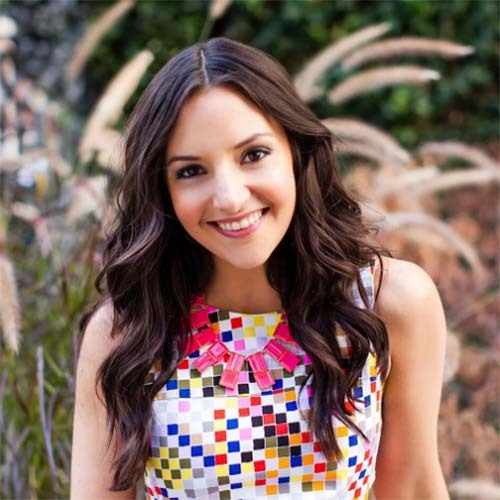 The viral story took an incredible turn when it was later revealed that the traveler was Brit Morin, the founder and CEO of Brit + Co, the lifestyle media company that boasts 130 million users. On Twitter, Morin wrote: "I lost my wedding/engagement rings last week somewhere between New York and Jackson Hole. A @United gate agent found it, put it in a safe, and then gave it to a pilot to HAND-DELIVER it back to me in SF. I have a newfound faith in humanity and airlines. Thanks United." Morin outlined the details of her incredible story at Brit's Blog, a popular feature at Brit.co. Morin is a frequent guest on ABC's Good Morning America. While in New York shooting a segment for GMA on February 8, Morin had taken off her rings, explaining, "I always do this — it feels odd having a giant camera zoomed in on my ring when I’m working with my hands on set." After the GMA appearance, Morin was scheduled to meet her family in Jackson Hole, Wyo., for a ski vacation. The GMA segment ran late and Morin found herself rushing to make a flight at nearby Newark International Airport. She packed her rings in a carry-on bag and made it to the gate just in time. But, since she had gotten there later than all the other passengers, there was no overhead storage available. She quickly transferred her rings to a small toiletry bag and jammed it inside her purse. The larger carry-on bag was tagged and sent below. Imagine Morin's horror when she got to her final destination in Jackson Hole and realized that the engagement ring and wedding band were gone. "Panicked, I searched all of my bags — my toiletry bag, my purse, and my suitcase — at least a dozen times, beginning to fear that the worst may have happened," she wrote. "It must have fallen out somewhere during the suitcase transfer. I must not have zipped my toiletry bag all the way. Oh, dear god, how was I going to tell my husband? (The bigger irony? We got married in Jackson Hole nearly seven years ago, and now here we were back in a town that symbolizes our eternal love and I had no physical symbol of that love on my finger.)" Fearing that she may never see her rings again, Morin went on the United Airlines website and filed a lost-items claim. Meanwhile, back in New Jersey, a United Airlines gate agent had found the rings on the jet bridge. She immediately put them in a safe pending the identity of the owner. 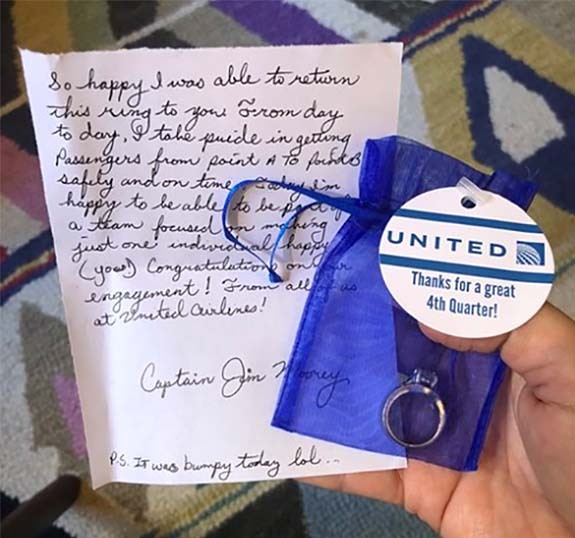 When she learned that the owner had come forward, the agent handed the rings to United Airlines pilot Captain Jim Moorey, who was happy to ferry the rings 2,500 miles to San Francisco, where Morin lives with her family. On February 15, Moorey hand-delivered the rings to Morin, along with a personal note that read, "From day to day, I take pride in getting passengers from point A to point B safely and on time. Today, I’m happy to be able to be part of a team focused on making just one individual happy." "I was ELATED," wrote Morin. "I expected them to shoot me over a FedEx or UPS tracking number, but instead they informed me they would be HAND-DELIVERING them back to me. I couldn’t believe it." Credits: Ring photo, Brit Morin photo via Twitter.com/brit/; Aircraft photo by United Airlines.